When you install Cloudera Manager, you can choose to select Cloudera Express(no license required), a 60-day Cloudera Enterprise Data Hub Edition trial license, or Cloudera Enterprise(which requires a license). You can later end a trial license or upgrade your license. You can use the trial license only once; once the 60-day trial period has expired or you have ended the trial, you cannot restart it. Only local users can log in (no LDAP or SAML authentication). Alerts cannot be delivered as SNMP traps. Operational reports are inaccessible (but remain in the database). Commands such as Rolling Restart, History and Rollback (under the Configuration tab), Send Diagnostic Data, and starting Cloudera Navigator roles are disabled or not available. To access the license page, select Administration > License. If you have a license installed, the license page indicates its status (for example, whether your license is currently valid) and displays the license details: the license owner, the license key, and the expiration date of the license, if there is one. At the right side of the page a table shows the usage of licensed components based on the number of hosts with those products installed. You can move the cursor over the to see an explanation of each item. Basic Edition - a cluster running core CDH services: HDFS, Hive, Hue, MapReduce, Oozie, Sqoop, YARN, and ZooKeeper. Flex Edition - a cluster running core CDH services plus one of the following: Accumulo, HBase, Impala, Navigator, Solr, Spark. Data Hub Edition - a cluster running core CDH services plus any of the following: Accumulo, HBase, Impala, Navigator, Solr, Spark. On the License page, click End Trial. Confirm that you want to end the trial. Restart the Cloudera Management Service, HBase, HDFS, and Hive services to pick up configuration changes. To start a trial, on the License page, click Try Cloudera Enterprise Data Hub Edition for 60 Days. Cloudera Manager displays a pop-up describing the features enabled with Cloudera Enterprise Data Hub Edition. Click OK to proceed. At this point, your installation is upgraded and the Customize Role Assignments page displays. Under Reports Manager click Select a host. The pageable host selection dialog box displays. Select a host and click OK. When you are satisfied with the assignments, click Continue. The Database Setup screen displays. Leave the default setting of Use Embedded Database to have Cloudera Manager create and configure required databases. Make a note of the auto-generated passwords. Select Use Custom Databases to specify external databases. Enter the database host, database type, database name, username, and password for the database that you created when you set up the database. Click Test Connection to confirm that Cloudera Manager can communicate with the database using the information you have supplied. If the test succeeds in all cases, click Continue; otherwise check and correct the information you have provided for the database and then try the test again. (For some servers, if you are using the embedded database, you will see a message saying the database will be created at a later step in the installation process.) The Review Changes screen displays. Review the configuration changes to be applied. Confirm the settings entered for file system paths. The file paths required vary based on the services to be installed. Warning: DataNode data directories should not be placed on NAS devices. Click Continue. The wizard starts the services. At this point, your installation is upgraded. Click Continue. 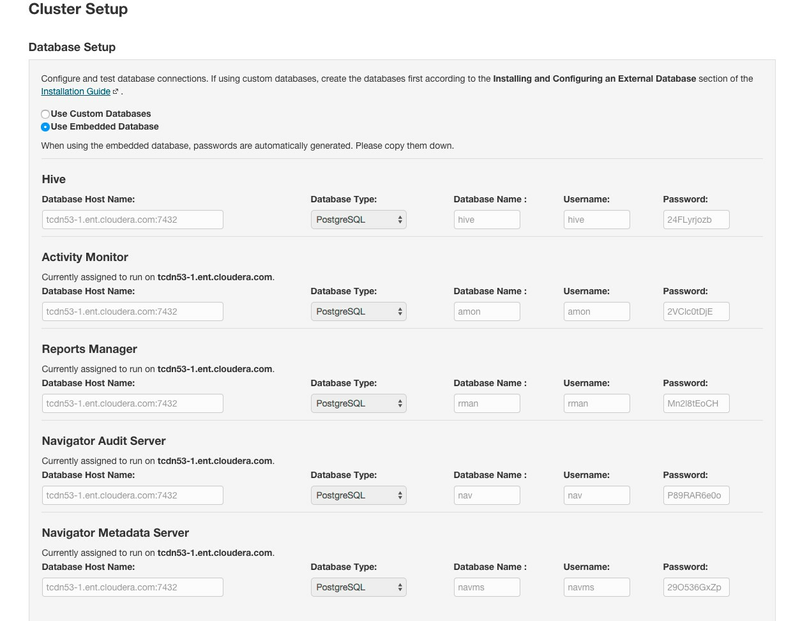 Restart Cloudera Management Services and audited services to pick up configuration changes. The audited services will write audit events to a log file, but the events are not transferred to the Cloudera Navigator Audit Server until you add and start the Cloudera Navigator Audit Server role as described in Adding Cloudera Navigator Roles. For information on Cloudera Navigator, see Cloudera Navigator documentation. Purchase a Cloudera Enterprise license from Cloudera. On the License page, click Upload License. Click the document icon to the left of the Select a License File text field. Navigate to the location of your license file, click the file, and click Open. If you want to use the Cloudera Navigator Metadata Server, add its role following the instructions in Adding Cloudera Navigator Roles. Download the license file and save it locally. In Cloudera Manager, go to the Home page. Browse to the license file you downloaded. You do not need to restart Cloudera Manager for the new license to take effect.